This appliance was delivered to the Summertown brigade in December 2009. It replaced the existing 34. 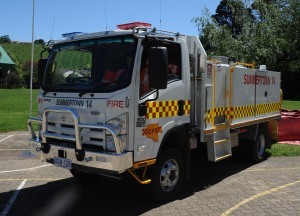 Summertown 34P is an Isuzu FTS800 crew chassis, 4 wheel drive, and carries 3000 litres of water. It is suitable for both rural and urban applications. It carries four breathing apparatus, a GPS unit and a chainsaw. Summertown 34P seats six crew. 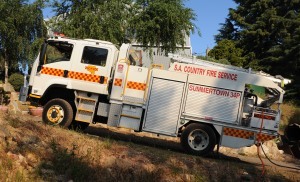 Summertown 14 is based on a Mazda T3500 chassis, is 4 wheel drive and carries 1000 litres of water. It can carry 4 crew. The small physical size and low centre of gravity makes this appliance ideal for the narrow winding fire tracks and driveways within the area. It is fitted with a GPS unit, and carries a chainsaw. East Torrens BW13 is based at the Summertown Station. 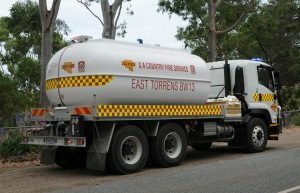 It is based on Isuzu FVZ1400 and carries approximately 13000 litres of water. I t is designed to carry up to three crew. It carries a portable dam, and a GPS unit.